It is the anniversary of my cousin Kayla’s passing. I cannot believe a year has gone by. I wanted to write a blog for today, not to make anyone sad but to tell you how her life changed mine. She was 26. That’s far too young, in my opinion. Her death was sudden and tragic and I will not get into the details. It was caused by domestic violence. I will say this, God moved Matt and I closer (in location) to her last year and I am grateful for each moment with her and glad Sammy and Sebastian loved and adored her. Just as, I know, Spencer would too. I recently got my third tattoo in loving memory of Kayla. Oddly enough each Tattoo I have has been every 7 years at age 18, age 25, and age 32. These tattoos are when my faith has grown or been tested and I have grown closer to God. They signify times that have changed me. And I was “marked” by these moments and the tattoo reminds me where I have come. 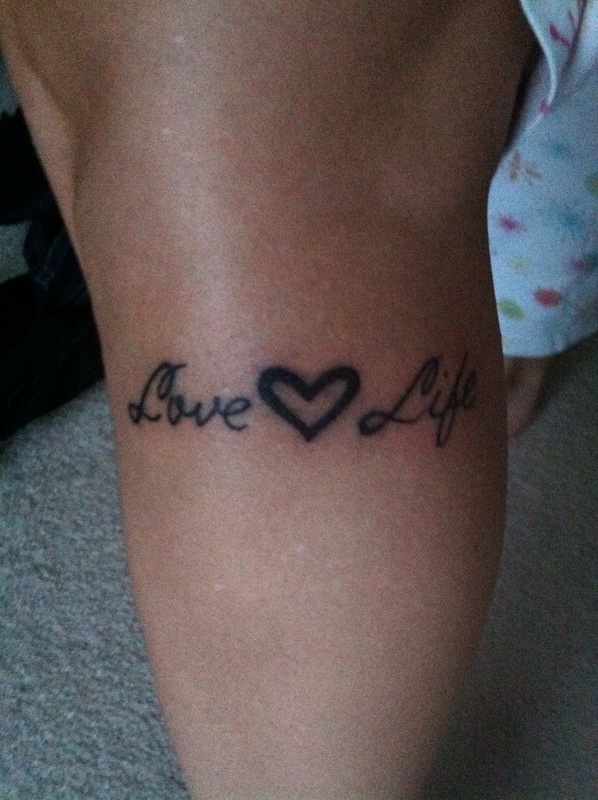 Kayla had a small tattoo on her wrist that said “Love Life”. Many members in my family have gotten this or another tattoo because she made us all realize that life without love and passion is no life at all. Jesus said, ” I am the way, the truth and the life”. The life. This really hit me. Love life=love Jesus. My passion for Christ has changed over the last year and grown my faith in a very significant way. It has also changed the way I see people and made me examine my own life and face the reality of death. These things are pretty deep but we cannot live our lives as if we don’t know that we won’t live forever. I don’t know when my time will come but I am going to live with passion each day that God gives me. I will love passionately, forgive, celebrate, teach my children, but most importantly love and share Christ. The man who passionately and unselfishly gave his life for my salvation. I do not have to fear death because of Him. So today I am celebrating the amazing life of Kayla Jacqueline Davis. She inspired me to love more fully, to share Jesus more boldly, and to hold my family closer and tighter. I cherish each day that I am given and with courage I can “Love Life” and love people. Because that is what Jesus calls us to do. May God give you peace if you are hurting right now. He is waiting for us to call on His name and ask for help. I encourage you to make Jesus Lord of your life so you can have the assurance of seeing those in heaven who also know Him. You can be forgiven and have eternal life. You can live the life God is calling you to live on this earth. You can fulfill his will for your life, if you only ask. I love you Kayla. You probably never realized how many people’s lives you touched. And the ripple affect of lives we will touch because of your story. You have inspired me to share my life and treasure each moment. I’ll see you on the other side. This entry was posted in Uncategorized and tagged Christ, faith, family, hope, life, love, mark, passion. Bookmark the permalink.